A modern-day reality for organizational leaders and managers across the country is that a host of factors have converged to challenge the traditional view of the workplace. The 21st century has seen the collapse of the old order. Technology, a more diverse workforce, and a generally more uncertain labor market demands a more collaborative and flexible working environment. Today, companies are working to understand and stay apace of this rapidly changing work environment. What changes do they need to make to manage a diverse, mobile, and multi-generational workforce? What strategies must they adopt to overcome the substantial challenges for recruiting, training, and managing a blended workforce? The answer: to succeed, companies have to become more agile and proactive, and not just hope their business model will automatically adapt. Leadership will need to demonstrate it can look forward and create an environment where employees thrive. Who or What Is Your Workforce? Even in a digital world, the workforce remains the most valuable tangible asset of any organization. Despite this, many companies fail to properly plan, measure or optimize it. This results in a lack of awareness on management’s part of what current or future workforce gaps will impede their overall business goals. Most organizations understand and acknowledge that workforce planning and data-driven employee decision-making is a top priority for their companies. So why the gap? 1.The lack of stated objectives. 2.The lack of a consistent process for workforce planning. 3.The lack of vision for how to make workforce planning more effective. Company leaders need to focus their time and energy on building a common-sense, yet effective course of action that addresses their workplace’s new reality. Using whatever tools are available, they must use workforce planning to ensure they are recruiting, hiring, and training the right combination of talent they need to drive business objectives. Typically full-time employees, balance sheet talent is the traditional organizational method of employing talent. Employees take on a job with the expectation that, assuming they perform at or above stated goals, they’ll have the opportunity to “move up the ladder” within the company. The company bears all the related costs for acquiring these employees. They receive benefits and are offered a sense of job stability. For companies, the challenges reside in development of new leadership, a shortage of qualified talent that wants a traditional job, the costs of engagement and churn, and an ever-growing skills gap. Experts predict this talent category will see the fastest decline compared to other emerging talent arrangements. Despite this prediction, most HR and talent procurement teams remain focused on balance sheet talent. An important emerging talent category, partnership talent is the reflection of a working world that is becoming more global. Companies, in an effort to increase their reach and capabilities, collaborate on various ventures. The result is talent effectively employed by more than one company. These employees must learn to adapt to two or more company cultures, employee programs, and business strategies. Today, partnership talent is most evident in joint ventures between U.S. and foreign companies, i.e. factories and other markets that require local talent. These employees are on a related balance sheet because the companies tend to have a joint ownership relationship. In a digital world, the arm’s-length approach companies historically took to this employment method is changing. Organizations need to reassess their talent programs, think about how to present a unified brand, and encourage a culture that spans all involved entities. Not to be confused with freelance or open-source talent, borrowed employees have traditionally been referred to as “temp workers,” but there is a big difference. Today, this talent is most often contracted through a contracting arrangement with a company that specializes in whatever field an employer is looking to outsource. These employees reside on someone else’s balance sheet, such as outsourced call centers. Are project based, which means employees only work when they’re needed. Offer financial flexibility for a company’s balance sheet. Bring in fresh insights from specialists and experts who are not driven by a company’s culture. No other workforce segment is growing at a faster pace than freelance talent. Freelancers work independently but are guided by and adapt to each company’s culture and business goals. The role they play depends on the organization’s needs. They might for a set period of time fill in for one individual worker or provide project support to an existing internal team. Freelance talent usually work on-site and collaborate most frequently with balance sheet talent. They can be hired on an hourly, daily, weekly, or monthly basis. Because they receive no benefits and often work on a short-term basis, they’re financially advantageous to a company’s bottom line. Challenges leadership face with freelance talent is how to effectively manage them, how to quickly communicate what is needed, and protection of intellectual property rights such as trade secrets, patents, copyrights and trademarks. Volunteer models, such as Wikipedia, which has over 100,000 volunteer contributors. Idea “marketplaces” like InnoCentive that post challenges professional problem solvers weigh in on from around the world. Project marketplaces such as Amazon’s Mechanical Turk for organizations that need human intelligence which they obtain through a 24-hour on-demand workforce. Open source talent differs from freelance and contract workers in a number of ways, but one key trait sets them apart: they are not hired to fill an open role or position. In fact, they usually work remotely, contributing to specific tasks and projects using online communities and networks. They do not work in offices or other facilities. Because the reach of open source talent is often global, the benefit of using these highly experienced and knowledgeable individuals is huge. Challenges tend to be in the areas of control and ownership rights. Redesign work itself for technology and learning. Source and integrate talent from all methods. Implement new models that reflect the changing organization structure. Making a change requires a shift in leadership, culture, and rewards practices. Here are five ways organizations can achieve a more collaborative, tech-enabled talent pool that will bring greater growth to their business. Do away with traditional job descriptions that limit them from finding the best talent for the overall organization. Expand their talent ecosystem by looking beyond traditional industry boundaries and working with non-traditional, balance sheet employees. Reimagine training and further education for their teams. Technology has created incredible opportunities for leadership to ensure their talent is performing at their peak performance. Redesign performance systems, measures, and rewards programs. Find ways for leadership to reimagine and reinvent what being a leader means. If the goal is to inspire an evolving talent ecosystem, managing a workforce that is composed of two or more workforce models requires a different set of leadership skills. Reassessing policies, reimagining lifelong education and redesigning the workplace for technology are all important elements that must be addressed by companies looking to remodel their workforce strategy. Leaders should start preparing now to redesign how they do business and how their employees function within the company structure. They must learn how to work with technology and competently manage many types of workers, on and off the balance sheet. 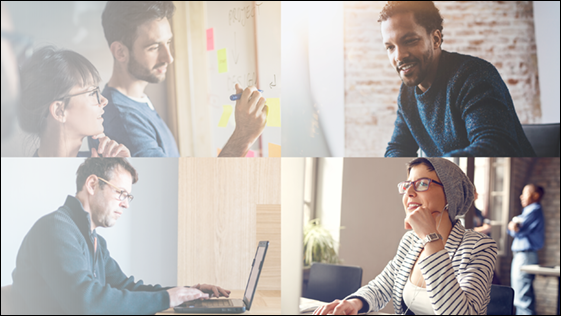 Doing so puts them front and center of a challenging yet exciting workforce evolution. Ditch the old ways of thinking and working! Discover a path for successfully transforming to a modern flexible workforce model. 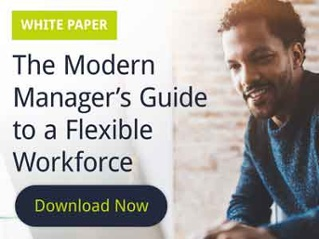 Download The Modern Manager's Guide to A Flexible Workforce: Create Fast, Nimble Team Through a Talent-On-Demand Approach.